There are some people who handle bees unprotected, but doing so is not very wise. Getting the best ventilated bee suit will keep you protected from their sting and ensure you won’t overheat. If you never bought one before, or you simply need a new one, you might not know where to look. We put together a short list of really good suits to check out as well as a presentation of things you should know before spending money. There are 3 major veil types: square, round and hood. Choosing one is a matter of personal preference, so first time users should try them all on before buying. The round veil is preferred by many keepers of bees, as the net stays away from the face. The same can’t be said about the hoods or the square veils, though. Not many hoods are well done, and as a result they collapse on the face, offering little protection. The squared veils on the other hand, may rotate and impair your vision. Despite their shortcomings, there are still folks preferring these styles. Regardless of the style, you should make sure the head piece can be completely removed. This way you’ll be able to clean the bee suit in the machine, as the veil is fragile and can only be washed by hand. The fabric of the suit is also important. Older models were made of thick canvas that caused the person to overheat. These days, these products are made of lightweight fabrics and even of multiple layers of mesh. While you might still feel hot in those materials, they’re much more breathable and bearable. However, denser fabric will better stand various weather conditions, should this be needed. Additionally, with a denser or thicker fabric you might be better protected against Yellow Jackets or Hornets. These places are the holes where your wrists and ankles are, but also where zippers and pockets are. This is because bees can be quite persistent in searching for an entry under the suit, and thus a spot to sting. The sleeves and the ankles of a bee proof clothing should be as close to the body as possible, and nearly impossible for them ro run up when bending or reaching forward. Elastic and hoops are the best way to secure these places. The ends of the zippers, and especially their tags, should be protected as not to allow it to get accidentally undone, and let bees in. These insects can also get into the pockets, and sting you when you take off the bee keepers suit. Bees will attack anything of dark color, therefore most overalls for beekeeping are white or light in color. You’ll find some suits in a camouflage print, and while they might be of good quality, you should still stick with white. The veil is black, and this is a standard color for this piece of the suit. This means it’s very important for it to stay away from your face. Additionally, it’s thin and bees can easily sting through it. The gear you get should be a bit bigger than what you usually wear. You’ll want to have some extra clothing underneath the suit, just to be safer from stingers. Some folks notices they get stung in the neck, even through the thicker overalls. To avoid it, putting a towel around the neck, and under the costume is the best solution. Now that you know what are the main considerations to remember while shopping, it’s time to see some items. We’ll describe their features as well as presenting you with their strongest and weakest points. This Humble Bee 410 beekeeper outfit is made of durable polycotton and features 6 resistant double-stitched pockets as well as brass zippers and a canvas carrying case. This suit is not too heavy, and the combination of synthetics and cotton offers the ideal protection against bee stings. It can be worn by both men and women alike regardless of the weather conditions, and will keep your body cool in high temperatures. The zippers can be easily pulled without getting stuck, and feature large rings which makes them convenient to spot when wearing the veil. The round veil can be removed and is easy to clean by hand, while the elastic ankles, wrists and waist allow it to stay in place for extra comfort. According to some customers, the veil is not as impenetrable as the suit and can potentially tear. This bee suit does not include gloves which need to be purchased separately. The bee-suit designed by Humble Bee offers complete protection against bee stings while keeping you comfortable throughout the day. The suit features 5 ventilation panels with mesh inserts made of synthetic fabric that allow you to remain cool in any kind of weather. This ultra breeze bee suit is suitable for people between 5’7″ and 5’8″ of both genders, and comes with a self supportive veil that can be detached and washed separately. It also features cushioned knee pads along with elastic bands for the wrist, waist and hands for improved safety and comfort. The bee-suit includes durable and effective brass zippers that keep even the most determined bees away, and 2 double stitched front pockets. Customers are advised not to wash the suit in the washing machine and spot clean it instead due to the risk of damage, however it can be washed using a gentle cycle. The suit comes packed in a deluxe carrying case for safekeeping. If you are looking for a reliable beekeeping suit, take a look at this Humble Bee product. This medium weight suit features a collapsible fencing veil which protects your face from bee stings, zippers made of brass with large rings that zip easily and double stitched pockets. The suit is designed to fit anyone with a height in between 6’4″ and 6’6″, and features elastics on the waist, wrists and ankles for a better grip. Due to its cooling abilities, it can be worn during all weather conditions. The combination of 50% cotton and 50% synthetics allow for enhanced durability against determined bees. The honey bee suit includes 6 front pockets as well as 4 hive tool pockets and comes in a durable tote made of canvas. The polycotton fabric is durable but also breathable for a plus of comfort, however both the veil and the suit aren’t recommended to be cleaned in the washing machine due to the high risk of damage. This suit provides a tailored fit on the body and features wrists, ankles and waist elastics as well as polycotton lined pockets. Its highly resistant brass zippers do not pose any inconvenience when pulling, and offer solid protection against more aggressive bees. The veil is made of mesh and goes all around the head in order to provide a perfect view. Along with the suit, the brand also provides a durable canvas tote in which you can store the item. This suit fits true to size, and can be hand-washed to avoid any damage done to the zippers. The fully synthetic fabric of this outfit is perfect for hot climates due to its aerated fabric, but will still keep you completely safe from bee stings thanks to its lightweight foam insert. 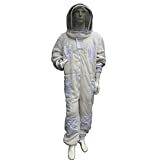 The bee protection suit fits beekeepers between 5’9″ and 5’10 of any gender, and its veil is easily removable in order to be cleaned separately. The hood veil offers a good view with unobstructed view and can be washed by hand. This item does not include gloves which should be purchased separately. The elastic bands at the wrists and ankles keeps the suit in place and do not allow bees to go inside. Weighing in at 3.49 pounds, the overalls are medium weight and can also be used regardless of the weather conditions. This protective gear covers the whole body, minus the hands and feet. It features elastics for the ankles, wrists and waist which provides an improved protection against bee stings. The suit features a full front zipper and a hood attached with a zipper which can be easily removed. 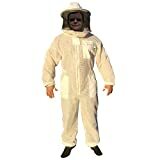 Made fully out of durable cotton, this bee-suit offers good protection against bee stings and improved comfort. Here you have a sting proof bee suit made of 2 layers of mesh and one of foamed plastic. It is also designed with 4 pockets, two of them are on the chest and 2 on the side of the lower part of the garment. The legs have reinforced patches to prevent the suit from wearing out too fast. To help the sleeves stay put, the suit is designed with loops for the thumbs. The cuffs and the ankles also shrink, for a better protection against the bees. If you need to wash the suit, make sure to detach the hood first, as it needs to be hand washed. Some reviews left by other users suggest to order a size up as the item seems to be on the smaller side. The gear Bee Smart 800 created has a hat and not a hood like many other similar items, helping you not to worry about the net. The head covering can be removed when it’s time for cleaning this piece. Unlike other models, this one is made of 3 layers of mesh, an aspect that makes it more suitable for both cold and hot weather. While the cuffs have elastic in them, there’s also a thumb loop to make it impossible for the sleeves to run up. There are straps on the legs as well, so the pants will also stay in place when putting on your shoes or boots. Additionally, the legs are zippered near the ankles to keep the pants next to the leg when putting on the boots. Great attention to detail has been paid during the making of the item, therefore all possible openings are carefully covered and sealed. Its only downside is that it may not always fit as expected. 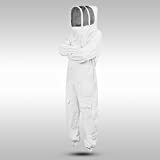 While the beekeeping suit will not directly touch your skin, you might want to buy one made of unbleached cotton. The one designed by BEes & Co U74 fits the description. One of the best things about this suit is its 2 year warranty. The suit has 3 pockets on the front, with 2 of them being on the pants part. It’s best to tape them closed as to prevent bees from getting in there, and stinging you while you take it off. There are 2 smaller pockets at the knee level, on each leg what have elastic at the top. The hood can be completely removed which is a good thing when trying to clean the item. To keep the sleeves from running up, the designers created 2 elastic loops for each thumb. You should be warned though, that the waist elastic can make you feel more hot when compared with a similar item without an elasticated waist. When working with bees, it’s better to wear a full uniform like the one created by Vivo. The fabric of this suit is lightweight, but offers very good protection against stinging bees. Its total length from the top of the hood to the ankles is 70.5 inches, making a good choice for those shorter than 5’10”, as to allow them to move freely. There are 4 pockets on the front of this suit, 2 on the chest and 2 at the hip level. The hood of the item can be completely removed, if you dislike its style or fit. Speaking of the hood, some people found its net falling too close to the face, and having to wear a baseball cap underneath. If you need to clean this suit, make sure to remove the hood first. The hood must be washed by hand while the rest of the garment can be washed with the rest of the laundry in the machine. Vivo suggest you a jacket with a partially zipped hood and with face protecting mesh. The fabric is polyester, however it’s lightweight and breathable. There’s also a pocket on the front in case you need to store something. Its size is 7 inches. You should know that the product doesn’t come with gloves, so you’ll have to purchase them separately. The jacket will protect you against all insects that could sting you, including wasps and mosquitoes. However, if you’re not properly dressed, you could still get stung. The hood is not designed as well as the rest of the jacket, so the net can fall onto your face. This allows some bees to find a way to sting your neck. It’s best to wrap a towel around the neck, underneath the jacket. To prevent the bees from getting under this garment, the bottom hem and the cuffs have elastic. Hopefully you learned something new while reading our article, and now you can be more confident while going shopping for a bee protecting clothes. You might now even be able to recommend something to others who are searching for something to wear when starting their own apiary or trying to remove hives of wild bees and wasps. These suits can be used to protect against various other types of biting insects as well, such as mosquitoes or ticks. Working with insects that have a stinger longer than 3 mm, you should wear more layers, or find another protective suit.